Karl Kautsky’s political bankruptcy was shown definitively at the onset of World War I, when he supported the vote of the German Social Democratic Party (SPD) for war credits, and in his later role as “left” ideologist for imperialist-backed counterrevolution against the Bolshevik Revolution of 1917. His anti-Communist views and parliamentary reformist practice were thoroughly exposed and demolished in such works as Lenin’s The State and Revolution (1917) and The Proletarian Revolution and the Renegade Kautsky (1918) and Trotsky’s Terrorism and Communism (1920), to name only the most comprehensive. Having made common cause with “democratic” imperialism against the Soviet Union, much of the (barely) nominally Marxist left is today even more deeply ensconced in bourgeois parliamentary democracy. These opponents of the revolutionary-internationalist workers movement are hostile, in deed and increasingly in word, to the Bolshevik Revolution and its world-historic significance as the model for socialist revolution. Bolshevism was fortified by the rich experience not only of the revolutionary movement in Russia but of the best practices of the workers movement throughout pre-World War I Europe. The contemporary neo-Kautskyites dismiss this legacy in order to applaud the opportunist practices of the German Social Democracy. To this end, they seek to deny the vast gulf that separated the Third International from the Second. 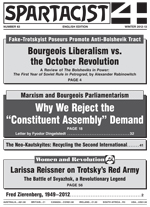 A review by Paul LeBlanc of the U.S. International Socialist Organization (ISO) claims that “it is Karl Kautsky who emerges as the theoretical revolutionary hero” of the book, adding: “The quality of his Marxist analyses—as represented in these pages—is of high caliber” (International Socialist Review, March-April 2012). Ben Lewis of the Communist Party of Great Britain (CPGB) lauds the book especially for refuting “the all too common dismissal” of “the legacy of Karl Kautsky and ‘Second International Marxism’ more generally” (“Permanent Revolution and the Battle for Democracy,” Weekly Worker, 9 August 2012). Supporters of the ISO, the United Secretariat (USec) and the British Socialist Workers Party (SWP) are prominent among the Historical Materialism crowd. The CPGB and others promote the views of Montreal-based academic Lars T. Lih, who has made a career out of denying that Lenin broke fundamentally with the Kautskyan/Second International conception of the “party of the whole class,” i.e., one party representing the entire working class. While sometimes using more leftist phraseology with regard to Russia in 1904-06, at home Kautsky continued his characteristic role of placating leftist forces within the SPD in order to ease the way for the right wing to run its affairs. As Paul Frölich noted wryly in his 1939 biography of Rosa Luxemburg, in this period “Kautsky was always willing to draw revolutionary conclusions if they concerned other countries, the past, or the distant future” (Rosa Luxemburg: Her Life and Work [London: Pluto Press, 1972]). In a similar manner, Day and Gaido cite the condemnation of the 1899 entry of French Socialist Alexandre Millerand into the bourgeois government by the 1904 Amsterdam Congress of the Second International. But they do not say that Kautsky authored a resolution adopted at the 1900 Paris Congress, where the question was posed acutely, that did not condemn Millerand but rather allowed that such class treason might be warranted as an “exceptional makeshift” (see “Marxist Principles and Electoral Tactics,” Spartacist [English edition] No. 61, Spring 2009). Day and Gaido also assert that Kautsky joined Luxemburg, leader of the SPD’s left wing, in “contend[ing] with theoretical and trade-union revisionists in Germany.” But they do not say that Kautsky abandoned Luxemburg in the fight over the mass strike in 1906, acquiescing to a deal with the opportunist trade-union leadership that buried a party conference decision in favor of the tactic (see Carl E. Schorske, German Social Democracy, 1905-1917 [Cambridge, Massachusetts: Harvard University Press, 1955]). Such dross is what defines various post-Soviet reformists as they promote unity on the basis of liberal democracy, or worse—with groups such as the USec, SWP and ISO embracing Syriza in Greece, Québec Solidaire in Canada and more (e.g., the Muslim Brotherhood in Egypt). CPGB spokesman Lewis spells it out rather bluntly: “The contemporary left’s particularly crude interpretation of the Third International, combined with its disdain for the revolutionary traditions of the Second International, have in part led us to where we are now—ie, organised in a swathe of competing sect projects with next to no immediate prospects of revolutionary party unity” (“Debating the Republic and Extreme Democracy,” Weekly Worker, 17 November 2011). Lewis hopes to breathe new life into a “stinking corpse,” as Rosa Luxemburg rightly called the Second International. Mistaking parliamentary cretinism for permanent revolution, Day and Gaido claim that Kautsky “was the first West-European Marxist to employ the theory of permanent revolution in connection with events in the Russian Empire.” This conclusion is not borne out at all in the eight articles by Kautsky included in the book. While he periodically used the phrase “permanent revolution,” citing Marx and Engels’ 1850 writings, Kautsky at no time transcended the concept of a radical bourgeois-democratic revolution in Russia. Though Lenin forged the party that confirmed the perspective of permanent revolution in practice, he is not among Day and Gaido’s “witnesses.” Prior to 1917, Lenin had an algebraic understanding of the necessary relationship of the workers to the peasants in the course of the Russian Revolution, expressed in his formula for a “democratic dictatorship of the proletariat and peasantry.” But the Bolshevik Party had been steeped in thoroughgoing opposition to the liberal bourgeoisie and in the understanding that the workers must arm themselves for an insurrectionary rising against the class enemy. Thus, for Lenin, the high point of the 1905 Revolution was the Moscow insurrection at the end of the year. This is a far cry from Kautsky, whose writings, going back to the early 1890s, were suffused with parliamentary illusions and glorification of peaceful revolution. In “Parliamentarism, Referendums and Social Democracy” (1893), Kautsky wrote explicitly: “Even today it is beginning to become clear that a genuine parliamentary regime can be as much an instrument of the dictatorship of the proletariat as an instrument of the dictatorship of the bourgeoisie” (cited in Massimo Salvadori, Karl Kautsky and the Socialist Revolution, 1880-1938 [London: NLB, 1979]). In one of the writings included in Witnesses to Permanent Revolution, Kautsky argued: “The revolution must take place through methods of peace, not of war” (“To What Extent Is the Communist Manifesto Obsolete?” 1903). Kautsky’s views stood in sharp contrast to the understanding developed by Marx and Engels after the crushing of the Paris Commune in 1871, when they concluded that the proletariat could not simply lay hold of the existing machinery of the capitalist state but must destroy it through socialist revolution. Beginning with Marx’s critique of the 1875 Gotha program and its call for a “free state,” the German party leadership, with Kautsky’s agreement or acquiescence, suppressed or bowdlerized a number of writings by Marx and Engels that were critical of the SPD’s softness toward the bourgeois state. This is one of the “traditions of the Second International” embraced by today’s neo-Kautskyites. Describing the Paris Commune as “the democratic republic of 1871,” the CPGB’s Lewis argues: “The question of republicanism matters because for Kautsky ‘when he was a Marxist’—as for Lenin, Marx and Engels—the democratic republic (annual elections of officials, recallability, workers’ wages for bureaucrats, the armed people, etc) was the culmination of the demands of the minimum programme: ie, the rule of the working class. This is why the soviets are merely a form of the democratic republic. It is the content that is paramount” (“Debating the Republic and Extreme Democracy”). While falsely portraying Kautsky as an avatar of the permanent revolution and covering up his role in catering to SPD opportunism, Day and Gaido sneer at Lenin’s struggle for a disciplined Marxist party. Their introduction attacks “Lenin’s high-handed view of centralised party control.” They quote without criticism fulminations against Lenin’s “organisational fetishism,” “sectarianism” and “personality cult” by David Ryazanov, who in 1901-03 led the tiny, opportunist Borba (Struggle) group and opposed the Bolsheviks until 1917. Similar attacks were leveled against Lenin by Trotsky in those years, notwithstanding the wide gulf between Trotsky’s perspective of permanent revolution and the Mensheviks’ opportunist tailing of the liberal bourgeoisie. For his part, Lars Lih tries to weave a fictitious continuity between Kautsky and Lenin on the party question through an arid textual analysis of a handful of Lenin’s writings. Lih dismisses the significance of the 1912 Prague conference at which the Bolsheviks, joined by a few of Georgi Plekhanov’s “pro-party Mensheviks,” carried out a definitive organizational split with Menshevik liquidationism. Ignoring the whole prior history of Bolshevism going back to 1903, Lih argues: “Lenin and the Bolsheviks did not set out to organise their faction as a separate party; they vehemently denied they had done so after the conference, and they were justified in making this denial” (Lih, “Falling Out Over a Cliff,” Weekly Worker, 16 February 2012). This is a bad joke. What Kautsky raised as a distant, hypothetical possibility in addressing the revisionist current in the SPD personified by Eduard Bernstein (from whom Kautsky never split) was flatly counterposed to Kautsky’s practice, both before and after the October Revolution. To say that Lih’s approach to the development of Bolshevism is undialectical would be to cast pearls before swine. As we note in Lenin and the Vanguard Party (Spartacist pamphlet, 1978; second edition 1997), an extensive account of the evolution of Bolshevism, in 1912 Lenin did not grasp the world-historic significance of the split with the Mensheviks. He “merely” understood that the Russian party could not move toward its goal of socialist revolution without a thorough and decisive break with opportunism. In 1914 Lenin generalized this understanding on the international plane. As we wrote: “Within a few weeks after the outbreak of war, Lenin determined to split with the social-chauvinists and to work for a new, revolutionary international. But he did not immediately present a theoretical (i.e., historical and sociological) explanation as to why and how the mass parties of the West European proletariat had succumbed to opportunism” (ibid.). What is utterly missing from Lih’s articles cited here is that the “unoriginal” Lenin developed a theoretical understanding of why a split with opportunist tendencies was absolutely essential in forging a revolutionary international. By early 1915, Lenin had begun to analyze the material basis for opportunism and social-chauvinism in the imperialist countries: “Certain strata of the working class (the bureaucracy of the labour movement and the labour aristocracy, who get a fraction of the profits from the exploitation of the colonies and from the privileged position of their ‘fatherlands’ in the world market), as well as petty-bourgeois sympathisers within the socialist parties, have proved the social mainstay of these tendencies, and channels of bourgeois influence over the proletariat” (“The Conference of the R.S.D.L.P. Groups Abroad,” March 1915). Only the twisted mindset of the Northites could conjure up the fiction that the “whole corpus” of Kautsky’s work is under siege by diverse “petty-bourgeois radicals.” The fact is that North himself prays at the altar of Kautskyan social democracy (see “Bourgeois Liberalism vs. the October Revolution,” page 4).